Communication between citizens and local administrations is a key element of well-functioning services. The rise of digital platforms and smartphone applications created new interfaces for communication and have shown the potential of civic tech in triggering structural change in how cities work, from civic engagement, to stronger participation in the accountability of municipalities or major awareness of citizen rights. 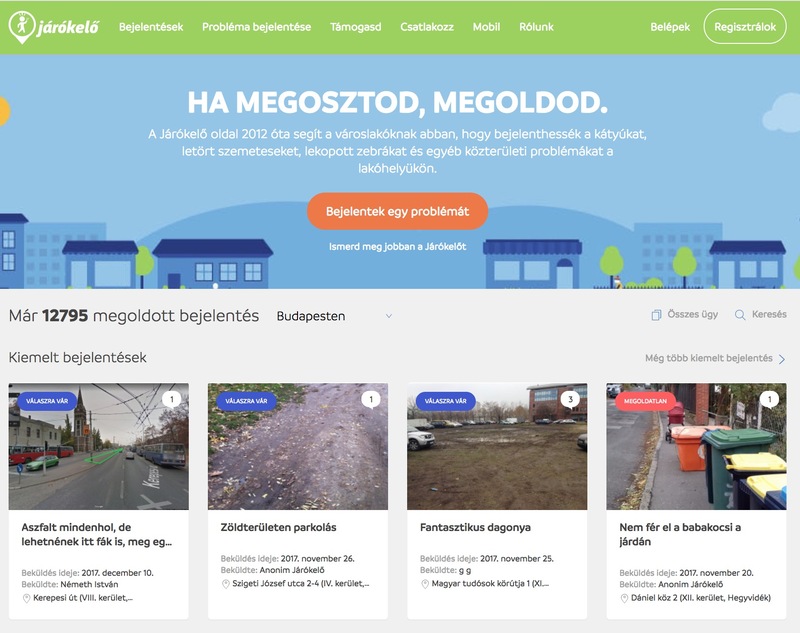 Járókelő, the Hungarian version of “Fix My Street” is a Hungarian platform inspired by its Slovakian counterpart that enables passers-by to report street infrastructure problems and subsequently inform the relevant department within local authorities. What is the origin of Járókelő? Járókelő is the Hungarian translation for “passer-by”, it refers to any citizen who is walking by and can be able not only to see a problem or malfunction, but also to report it in an easy and efficient way. Notifications range from water leaks to bad signposting, from street potholes to malfunctioning public lighting. It was originally launched in 2012, as a localised version of ‘Letter to the Mayor’ – Odkaz pre starostu – run by Slovak Governance Institute, a Slovak NGO. To put this into motion in Hungary, in 2011, we applied for an initial grant with the Visegrad Fund to bring the Slovak system to Hungary and thence take off. How easy was it to adapt the system to the Hungarian context? At the beginning, the platform was fully based on the Slovak system, but through the years and because of current context characteristics, it has become a completely independent system. Járókelő now has its own code base, which was developed by Mito, a Budapest-based communication agency. The current version was released October 2016. Even though in Hungary the Act CLXV 2013 deals with complaints and public interest, each state and district deals with them in a different way because the regulations of how to deal with those issues are actually made locally. In the case of Budapest, for example, every one of the 23 districts has a different format, different files and deadlines to answer and reply to the submitted complaints. In fact, some districts do not answer at all, others answer by post, asserting that someone of the Járókelő team should scan and then send the letter by email to the plaintiff or upload it in the platform. Overall, there is no corresponding protocol to deal with the replies of the complaints. The lack of streamlined communication is also revealed by the fact that very often these local authorities use patronising and simplistic linguistic forms in their answers to citizens. What does Járókelő do in this process? 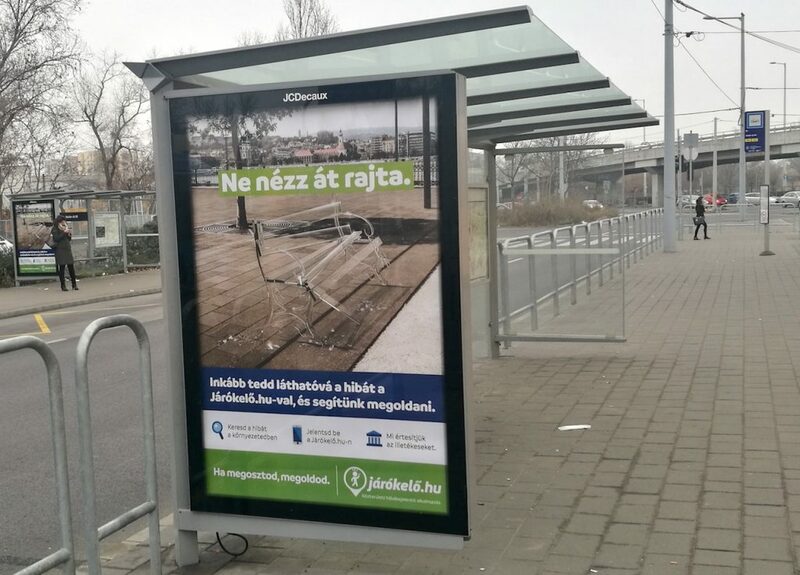 Járókelő itself does not answer complaints: it facilitates a platform for citizens, either by web software or mobile application to report local problems. It works in quite a simple way. When passers-by encounter a problem like broken street lights or illegal waste-dumping , they take a picture, upload it on to the platform and select the appropriate label. The next step is to add a short description about the issue they would like to submit. The report is reviewed by administrators of the website, and it is sent to the local government or service provider by email. Once it is sent to the local authority, it is subsequently shown on the website, to inform the users. Should there be a response from the local office, it is updated on the platform as well. The submissions are tracked as “solved”, “unsolved” and/or “in progress” on the website. So, the user can follow the progress of the whole process. 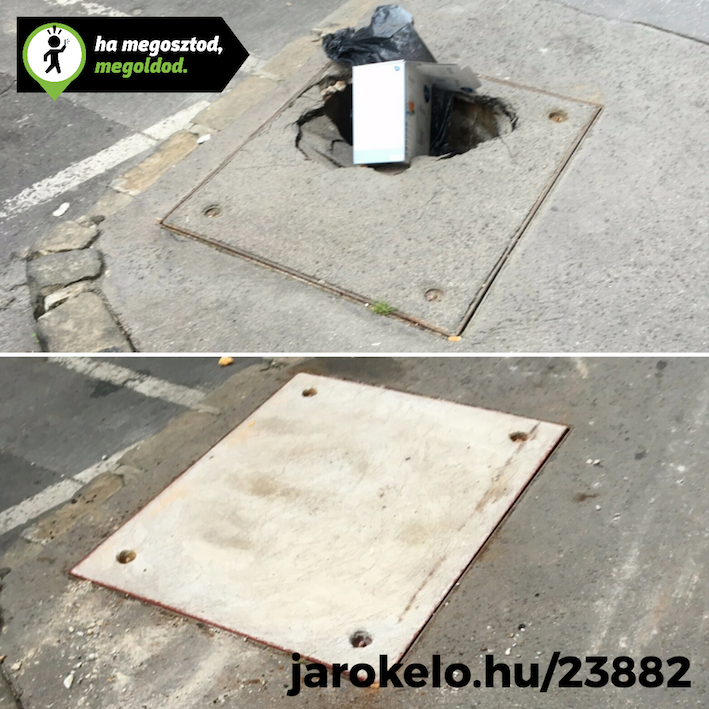 The main difference between Járókelő and other platforms, such as “Fix My Street” is that the official answers are made public. Anyone in the platform can follow the story. How did citizens embrace Járókelő? In its five years, Járókelő has been extremely well received by the citizens, as statistics show. It has grown considerably over the years since it started, nowadays it has reached around 20,000 visitors per month and registers 30 to 50 complaints per day in Budapest alone. The use of the platform also allowed us to identify some interesting and sometimes surprising trends: for example, Spring and Autumn are the strongest periods in terms of complaints, either because people are more disoriented due to the changing weather and/or perhaps because strong rains can visibly affect the functioning of infrastructure. The whole venture has not only grown in terms of the number of visits and reports but also in terms of the number of locations such as Debrecen, Kecskemét, Veszprém, Szeged and Szentendre, cities that have joined the system. Currently we have established an Association – Járókelő Egyesület – dedicated to the full-time operating of the website and building a community around the operations. Who are your most important partners in this operation? Járókelő has been very resourceful when it comes to gathering support and acquiring funding from different organisations and companies through corporate social responsibility schemes. We have also engaged with local charities as partners. This means that a local charity can provide a person to manage the local Járókelő site and promote the platform locally, covering themes and communities that the Budapest office cannot reach out to. Local organisations understandably have much more knowledge, insights and connections regarding local newspapers and forums. These charities can be either officially registered NGOs or informal groups of citizens gathering and looking for improvements in their own streets. Another type of interesting partners for us are municipal non-profit companies that manage litter and maintain parks. One of these companies currently signed a donor contract: it is an important event, signalling the first time a local government approached us because they like and understand what we do. Nevertheless, cooperation with local authorities has not always been easy. On the contrary, in many cases, municipal offices have been reluctant to cooperate with Járókelő. It really depends on the actual place and the people working in these offices. Some districts have a higher political willingness to promote this. As an example, Budapest’s 8th district used to be one of the best municipalities in responding to Járókelő, but they are now stepping back. How can platforms like Járókelő change public-civic relationships? Technology can enable citizen engagement. Platforms like Járókelő and others are tools that can have a positive impact on strengthening democratic institutions, transparency, accountability and foster public participation in public life. Járókelő functions as a bridge between citizens and local authorities in the common need to solve immediate problems in the built environment. As most of the problems reported are easy to fix, local governments can easily give a positive response to citizens. However, institutions need to be faster and more adaptive to new technologies that can foster their capacity to respond to citizens. When the platform was launched, municipalities were unprepared for such an engagement, did not fully understand the platform and how it could be beneficial for them. As many of the municipalities lack the capacity of innovation to make their services more efficient and user-friendly, we can provide a platform that helps their work. Therefore, similarly to many other civic tech platforms, Járókelő can create a win-win scenario, building up trust between local governments and citizens, and improving public spaces. Can these civic tech applications change mindsets? What we can see is that Járókelő has more impact on younger age groups who grew up and have been more influenced by new technologies and mobile applications. Platforms like Járókelő makes them more proactive when it comes to their environment. A lot of charities that have been supporting Járókelő are led by young people who look for improvement in their local communities. For them, the interaction between these two worlds, the physical and the digital, is less problematic than for older generations. Digital tools can shorten the distance and close the communication gap between public servants and citizens, delivering more direct messages to decision-makers. Ideally, this can improve communication between public offices and citizens and create a feedback cycle, resulting in better communication channels and more accountability and transparency. Marietta, L. (2016) The role of civic technology in holding power accountable. (Communication and Media Science Degree). ELTE University. Budapest, Hungary. Patel, M. et al (2013) The emergence of Civic Tech: Investments in a growing field. Knight Foundation. Budapest, Communication, Governance / Shared administration , communication, data, digital transition, English, governance, maintenance, municipality, participation, platform, public spaces.